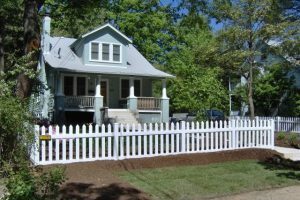 Keep your fence clean this spring with these tips! Spring is the time of year when many people start to spruce up the appearance of their homes. Spring cleaning usually starts on the inside but also includes new landscape designs, lawn maintenance, and fence cleaning. If cleaning your residential fence is on your to-do list this spring, follow these tips to revive and refresh its appearance! To clean and refresh your vinyl fence, you’ll need a water hose, soapy water, vinyl cleaning solution, cloth rags, and a soft scrub brush. Throughout the year, a lot of dirt and grime has probably accumulated on the surface of your vinyl fence from grass clippings, leaves, and other debris. While it won’t affect the integrity or structure of your fence, it will make it look old and dull. To start, use your water hose to spray your fence, removing any surface grime. Then, use a combination of soapy water and vinyl cleaning solution to lightly wipe down the fence. If necessary, use a soft scrub brush to clean harder-to-remove dirt. Rinse it off and allow it to dry. To clean your wood fence, you’ll need a water hose or power washer, wood stain, and bleach or wood cleaning solution. Dirt and grime from the environment can cause your wood fence to lose its brightness and even foster the growth of mold. If necessary, you can use plastic sheets to cover and protect your grass while you’re cleaning the fence. Use a mixture that includes one part bleach and two parts water, or a wood cleaning solution. A power washer is effective for removing old stain and paint from the surface. After using one of these techniques, spray the fence off with water and allow it to dry. After it’s clean and dry, apply a stain to help revive the overall appearance of your fence. To clean your steel or aluminum fence, you’ll need a water hose, soft scrub brush, and soapy water. It’s a fairly simple process that may only require a spray with the water hose. For more in-depth cleaning, use some light scrubbing with soapy water to remove tough stains. This entry was posted on Friday, April 13th, 2018 at 2:57 pm. Both comments and pings are currently closed.